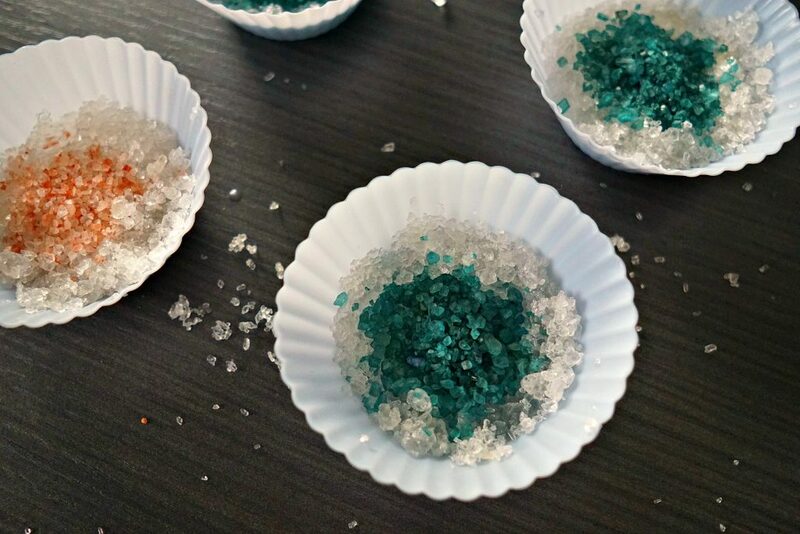 Don’t bath salts look just like tiny crystals!? 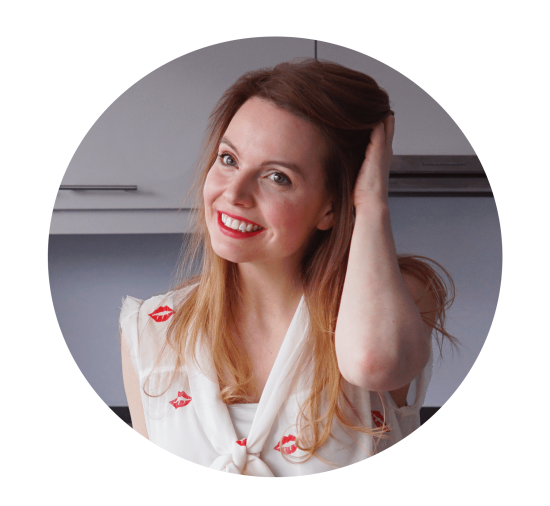 I was actually thinking of new massage bar ideas (with valentine’s day approaching and all) and all of the different ways you could give them texture. My mind was just wondering about salt when this vision of geode-shaped bars popped up in my head. The only problem: they would probably be a bit scrubby as lotion bars. And then I realized: they belong in the bath tub! So I came up with this recipe for Bath Salt Melts, tried it, and I’m pretty happy with how they turned out. Don’t they look cute? #prouddiymommy over here! You can also use 1 kind like epsom salt or use different proportions. All coconut oil works too. Just make sure they don’t melt at room temperature. Store them in the fridge if necessary. You can also substitute 1 tbsp. of salt with himalayan salt, which has a natural pretty pink shade! 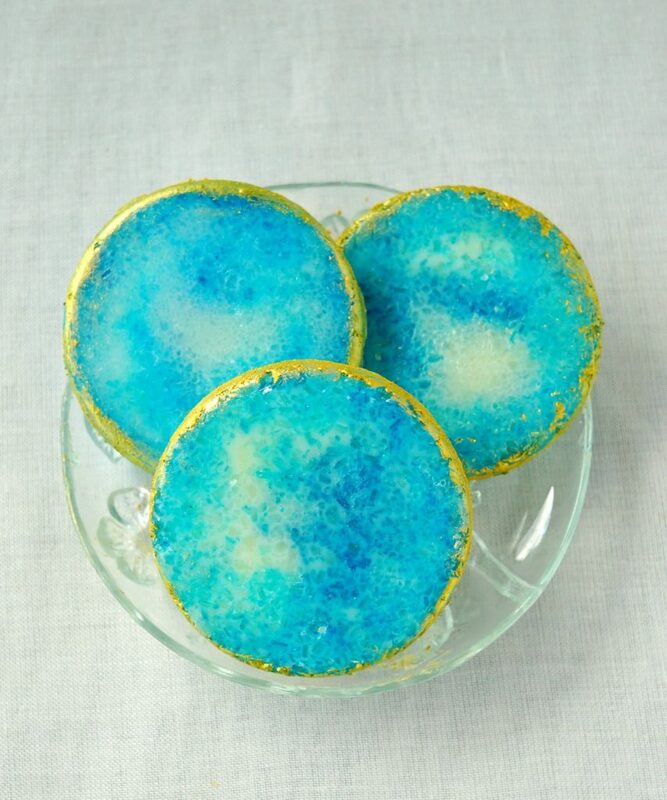 Use 1 tablespoon of salt for a pop of color in the middle. I colored the coarse sea salt because I’ve found that these absorb coloring the best. 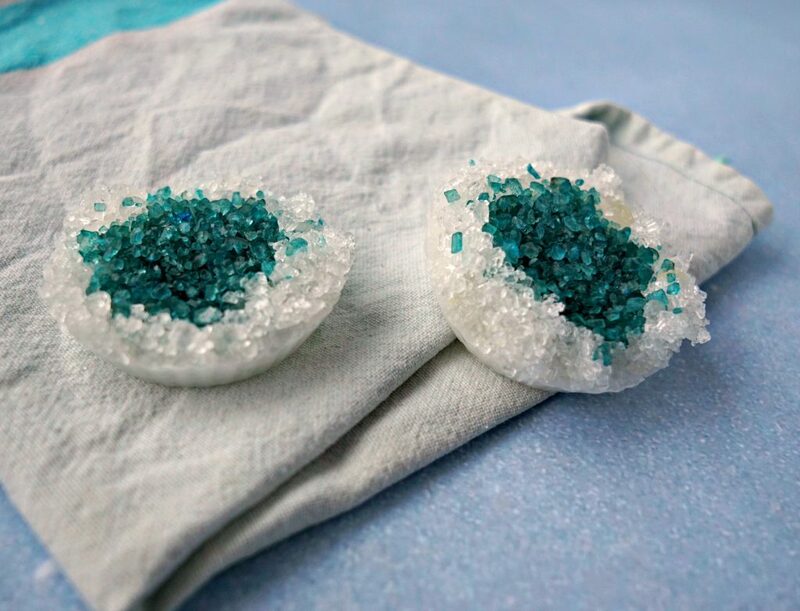 Put the sea salt in a seperate bowl and add 1 drop of soap or food coloring. Stir well to combine and let the salt sit while it absorbs all of the coloring. I was actually trying to make a purple colored salt by using 1 drop of blue and 1 drop of red soap coloring. But for some reason it turned out this emerald blue/green-ish color. Melt 1 tablespoon of Shea butter and 2 tablespoons of coconut oil in a double boiler or in the microwave. Make sure it’s all melted but at the same time don’t let the mixture get piping hot. Pour about half a tablespoon of the mixture in each mold. You should have a layer of about half an inch in each one. I really recommend using flexible molds for this DIY. I used cupcake molds. Now for the bath salt layer. Sprinkle a bit of salt on top of the mixture. I used 2 heaping tablespoons of dead sea salt and epsom salt around the edge. And then I added the blue sea salt in the middle. The salt should barely pop up above the mixture layer. 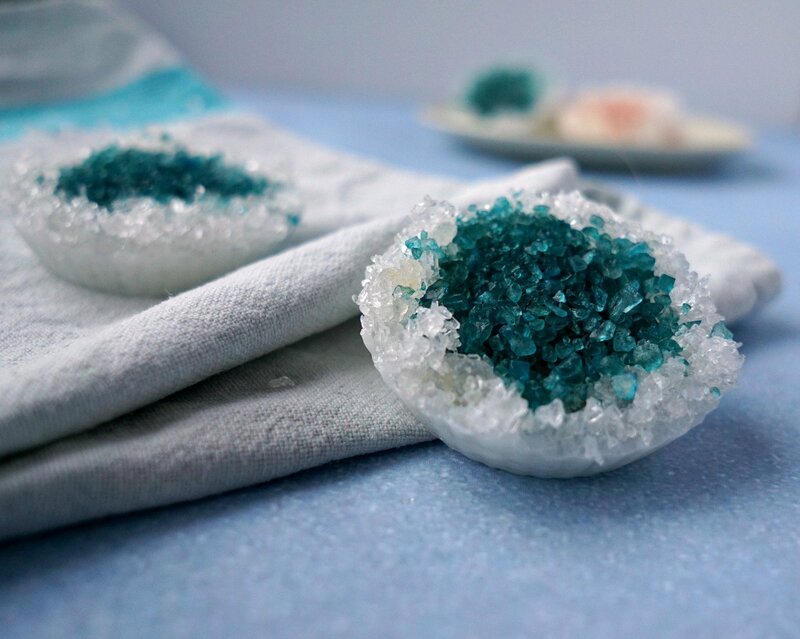 Let the bath salt melts harden in the molds. Pop them out as soon as they look ready. 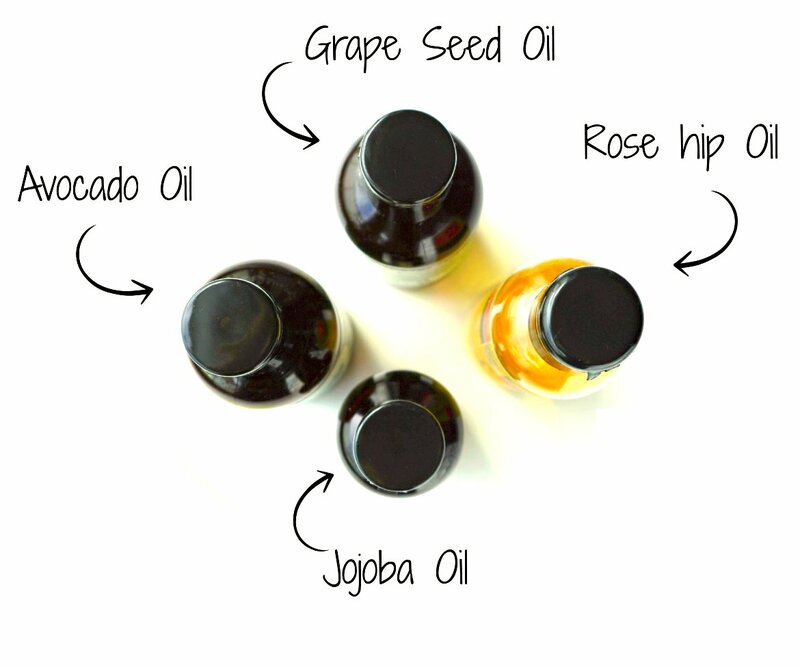 Drop one in your bath water to release the bath salts and moisturzing oils. Or add two. Or three. 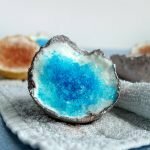 My Agate inspired DIY Bath Salt Melts that uses a similar recipe with different results! 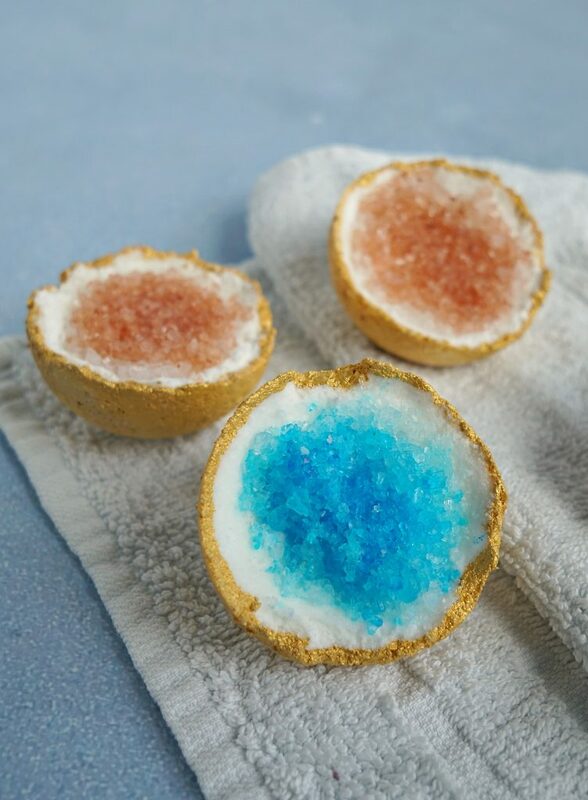 or check out my DIY Geode Bath Bombs for even more bath fun! Found your blog trough Pinterest, which I’m now following, and I just want to say that I’m really liking it, gorgeous photos and fantastic ideas, I especially love the look of this one. What a sweet comment Daniela, thank you!! My husband is going to be so excited when I show him this! For some reason he’s currently really excited about both geodes and bath bombs. Oooh, gorgeous! Found this on CraftGawker and I’m in LOVE! What a great idea–so cute!! On the cupcake molds geode are they fizzy? HELP!! 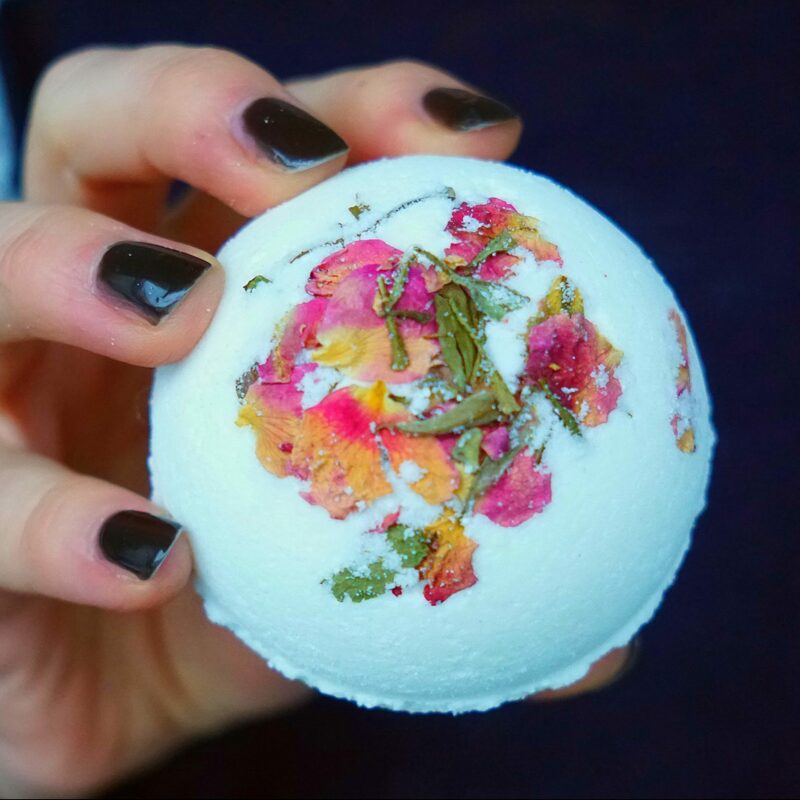 My bath bombs came out great – initially. But after taking out of the refrigerator and sitting at room temperature for a little while, they crumbled. What did I do wrong? Hmm … I’m not sure. Did they melt? Than I would try adding more shea butter next time. If they broke into little chunks maybe you used too much salt compared to the oil/butter mixture and they didn’t ‘stick’ together like they should. I would put the chunks back into the molds (I really recommend using flexible molds) and drizzle some more oil/butter mixture on top. Hope this helps!!! That might mean you’re allergic so it’s good you’re avoiding it! I would try all Shea butter instead.